During the darkest days of the Civil War, wicked cutthroats came into possession of six pistols of otherworldly power. 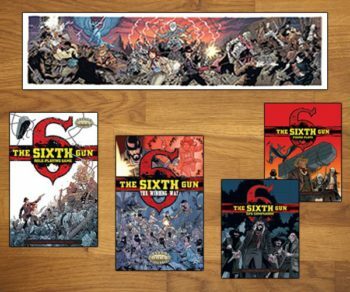 In time, the Sixth Gun, the most dangerous of the weapons, vanished.The First of the Six strikes with ungodly force. The Second spreads Perdition’s flames. The Third kills with a flesh-rotting disease. The Fourth calls up the spirits of those it has slain. The Fifth can heal the wielder from even a fatal wound. 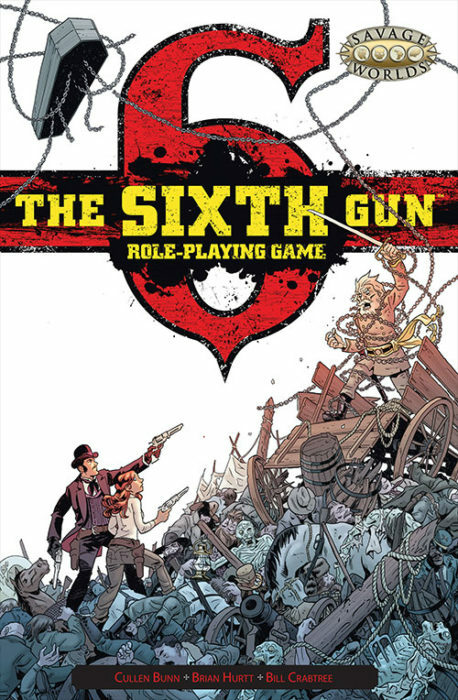 And the Sixth is the key to rewriting the world.Discover the secret of The Six—mystical weapons forged by hatred, and oiled in betrayal—in The Sixth Gun roleplaying game. Inside you’ll find details on Cullen Bunn and Brian Hurtt’s incredible world from the Harvey and Eisner Award nominated comic series by the same name. 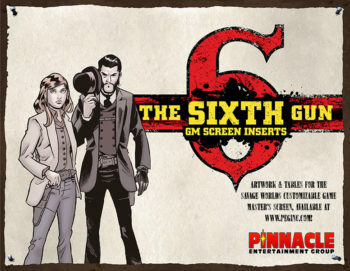 It includes new Edges and Hindrances, guns and gear, Setting Rules, rules for sorcery and voodoo, an Adventure Generator, and a host of nefarious rogues, gadflies, and scoundrels, for one of the wildest Westerns in all of comics! Requires the Savage Worlds core rules to play.